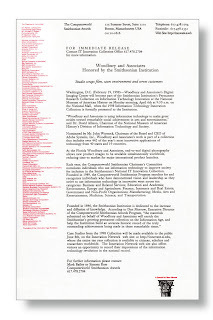 It was 13 years ago today that Woodbury & Associates was nominated by John Warnock, then CEO of Adobe Systems Inc., to become part of the Smithsonian Institution's Permanent Research Collection on Information Technology Innovation. 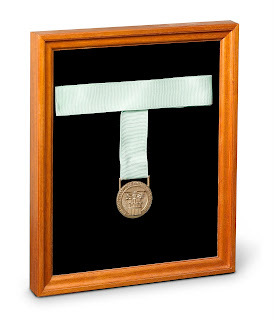 We were formally inducted when the 1998 I.T. Innovation Collection was presented to the Smithsonian Institution on April 6th, at a presentation on the National Mall with the iconic symbol of the institution, The Castle as the background. 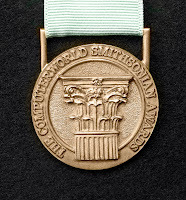 Woodbury & Associates is proud of it's recognition by the Computerworld Smithsonian Program for its "innovative application of technology" and its permanent inclusion in the National Museum of American History's Division of Information Technology and Society. This award was bestowed on Mark Woodbury and his photography and graphic arts team for the transition from film, to an end to end digital photography solution "Do it once, Do it Digital" allowing new product announcement photography, for corporations like the IBM PC Company, to be available simultaneously worldwide, reducing time to market for major international product launches. This innovation continues to date and has broadened to include not only still product photography but also our highly requested award winning product animations. One such recently completed animation will be getting it's international debut at the upcoming EuroShop 2011, The Global Retail Trade Fair in Dusseldorf, Germany. We will post a blog on this animation after the product is introduced, on February 26th.